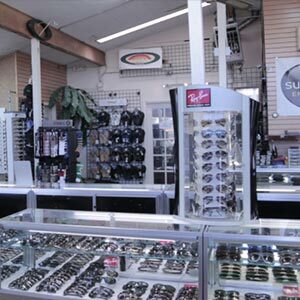 About Us - Sunglass Emporium is Northern Arizona's largest sunglass and prescription optical store. We have been family owned and operated since 1988. Sunglass Emporium has been locally owned and operated since 1988. The original Surf Shop concept known as Velocity was a local favorite in Prescott for over 15 years, selling only a handful of sunglass brands during that time. However, with the rapid growth of sunglass manufacturers and their desire to become a specialty sunglass store, the family closed one door and opened another. Sunglass Emporium stocks a large number of quality brands that fit any lifestyle and budget. The store’s knowledgeable and highly trained staff is there to guide you through the process of learning to match the customer’s lifestyle requirements to their sunglass needs. And most importantly, as a locally owned and operated business they will always strive to make customer service our top priority.